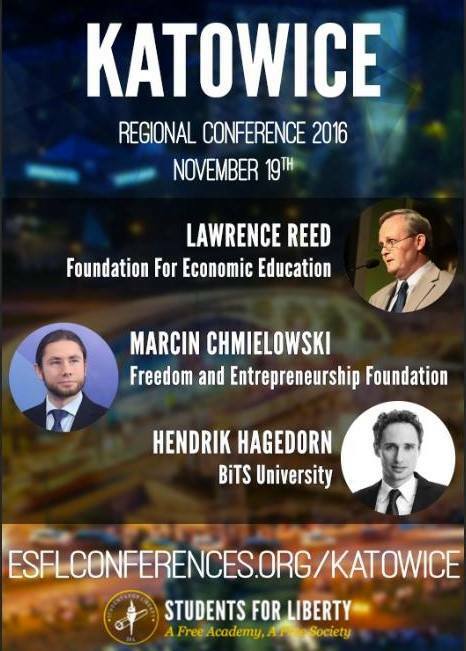 European Students For Liberty Regional Conference in Katowice on November 19th! 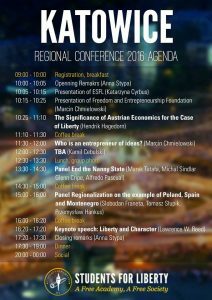 European Students For Liberty Polska and Freedom and Entrepreneurship Foundation invite you to participate in the first Regional conference ever held in Katowice, Poland! The conference is a great opportunity to meet like-minded students and hear interesting speakers from all around the world. Attendees will not only listen but explore and participate in various discussions. After the great success of the last European Students For Liberty regional conference in Wroclaw with more than 180 participants, this year we expect even more students from all over the Europe. The conference registration includes all meals for the day, as well as a social in the evening. 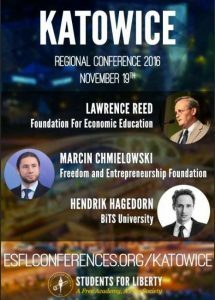 You’ll also have the opportunity to network with pro-liberty students and advocates from all over Europe, as well as access free books and resources. The languages of the conference are English and Polish. The dress code is business casual. The registration is free of charge. You can register HERE.